While performances of Wagner’s mature operas are almost ten-a-penny in Germany nowadays, with even the gargantuan Ring seeming to hold no fears for the smallest houses, the composer’s three early works, Die Feen, Das Liebesverbot or Rienzi rarely - if ever - get an outing. In the space of just one week, two opera houses in Germany, only a couple of hours’ drive apart, have ventured to put on new stagings of Wagner’s first complete opera, Die Feen, written when the composer was just 20; it was a mouth-watering opportunity to get to know a work that is so rarely heard, either live or on record, and, which like Das Liebesverbot and Rienzi, is actually banished from Wagner’s holy of holies, Bayreuth. Kaiserslautern, in south west Germany, was the seemingly unlikely venue for the first of the two productions, which opened on February 5 and the curtain went up on a rival staging just a week later on February 12 in Würzburg, a drive of just two-and-a-half hours eastwards. Würzburg’s director, Christian Pöppelreiter, was able to cite historical reasons for venturing to stage a work that even the most ardent Wagnerians do not know. It was in Würzburg, where he was chorus director, that Wagner originally composed his "romantic opera" in 1833, even if it was never actually staged there and only received its premiere in Munich in 1888, five years after the composer's death. The new production was a gift from Würzburg’s huge Richard Wagner Association to celebrate the 200th anniversary of the city’s Mainfrankentheater. Reitmeier, in Kaiserslautern, could boast no such historical pedigree. But his argument for choosing the work, rather than tackling one of Wagner’s ten mature operas, was refreshingly simple - to unearth a new oeuvre in the sacred Wagner canon in a country which must be close to reaching saturation point in productions of the Ring. Full marks, then, to both houses for their courage and sense of adventure in tackling such an unknown opera at a time when other companies seem to believe that only works of mass appeal can help safeguard their budgets. 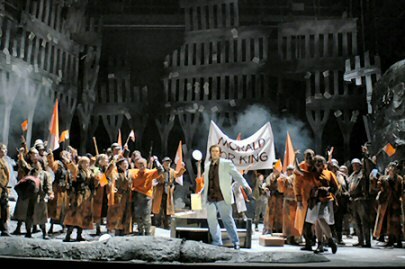 Fortunately for Pöppelreiter, the Würzburg production was blessed with a more generous budget from the world’s biggest Richard Wagner Association, and was therefore able to import bigger names. Indeed, Würzburg was the higher profile affair altogether, with even the composer’s 85-year-old grandson Wolfgang in the first-night audience, alongside his second wife Gudrun. Interestingly, their daughter Katharina, who made her directing debut in Würzburg a couple of years ago with a surprisingly irreverent production of Der fliegende Holländer, was absent. And as a piece of music theatre, it was probably Pöppelreiter’s that was more convincing. Pöppelreiter, who has already staged the complete Ring in Graz, trims and shapes Wagner's rather convoluted fable of a love between a fairy and a human to his own ends. According to the story, based on a fairy tale play La donna serpente by Carlo Gozzi, King Arindal falls in love with fairy Ada. In order to seal their love, Arindal must promise not to ask Ada who she is, or where she comes from, for a period of eight years. But his curiosity gets the better of him and he asks the forbidden question before the time is up. As a result, Arindal and Ada must undergo a series of difficult tests, at the end of which their love finally triumphs and Arindal achieves immortality. The themes of redemption, a forbidden question, and a love between a mortal and a supernatural being all recur in Wagner's later works, and musically, too, there are striking harbingers of motifs from operas such as Holländer, Lohengrin or Tannhäuser. But with its succession of individual numbers, Die Feen resembles more the operas of Carl Maria von Weber, Heinrich Marschner, or even Beethoven, than the stage works of the mature Wagner. Nevertheless, the composer's grasp of the orchestra at the tender age of 20 is astonishing, even if the dramatic weaknesses of Wagner's own - sometimes ham - libretto are clearly apparent. 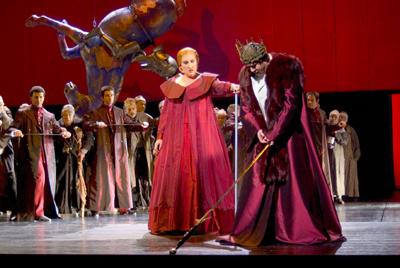 For Pöppelreiter, the central figure of the drama is the Fairy King, to whom Wagner assigns only a subsidiary role, and his lust for power. And the Würzburg production offers us anything but a happy ending. The two lovers are crushed by the systems they try so valiantly to break out of. Arindal loses his mind and Ada becomes merely a puppet for her power-hungry father. Jörg Kossdorf's clear-cut designs, bathed in threatening reds and blacks, underline the darkness of Pöppelreiter's reading and the brooding malevolence of the fairy world. And the costumes of Götz Lanzelot Fischer are similarly simple and effective, with Ada's long, sweeping gown and the train of Arindal's robe becoming the means by which their respective kingdoms hold and trap them. The fairies are clothed in Gothic/Punk black. 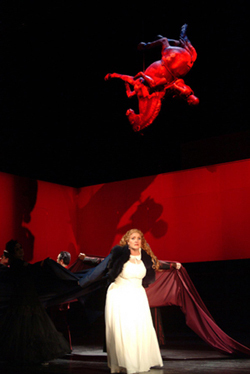 While Pöppelreiter's retelling of the story is almost classical in its stringency, Reitmeier in Kaiserslautern opts for the visually more "baroque". 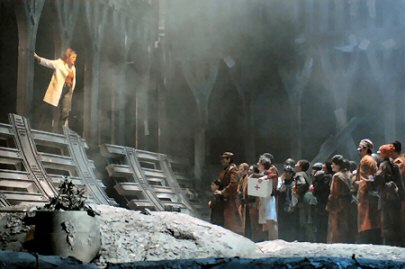 His set designer, Thomas Dörfler, places the action in what appears to be "Ground Zero" in New York, with the bombed out shell of the building bearing more than a passing resemblance to the shattered remains of the World Trade Center. The fairies, here, as in Würzburg, creatures more malevolent than benign, emerge from and return to what seems to be a meteor or a spaceship from another world, while Arindal's kingdom of Tramond is peopled by the injured masses, the fire-fighters and rescue teams of September 11. Reitmeier's ending is also not a happy one. Compromised by his repeated doubts and weaknesses, Arindal's love is not able to transform Ada into a human. And the two lovers must remain trapped in the cold, sterile immortality of the fairies. Musically, the two productions are also very different. In Kaiserslautern, the principals were all members of the Pfalztheater's own ensemble. And full marks should go to Reitmeier for that reason alone. But without the aid of surtitles, "Textverständlichkeit" did not seem to be top priority in the house. And with such fiercely difficult lead roles, Kaiserslautern's own lead tenor, Alexander Fedin, was simply not up to the taxing part of Arindal. The Mainfrankentheater's musical superiority was evident from the very first chord. The young US conductor Evan Christ, first Kapellmeister and deputy GMD in Würzburg, was in perfect control of the Würzburg Philharmonic and also seemed to have a much securer grip on the score. And his soloists, too, were of a different calibre. American tenor Edward Randall sang Arindal, with a well-rounded, secure voice, even if he looked constantly perplexed and puzzled by what was going on around him. Würzburg's own Deborah Mayer gave Ada a full-bodied Wagnerian soprano with no hint of squalliness and was perfectly able to scale back to a delicate piano where necessary. Diction was admirably clear in all parts, but never more so than in Andreas Bauer's Gernot. Rachel Tovey was striking both in figure and voice as Lora and Silke Evers sang Drolla with a delightfully light soprano. And special mention should perhaps be made of both choruses which excelled in each of the productions. At the end of the day, I would probably choose Würzburg's as the more satisfying and well-rounded evening, if pressed. But the sum of the Kaiserlautern production was also definitely better than its parts and should in no way be sniffed at either. Furthermore, the chance of seeing two new productions of Die Feen within such a short space of time is surely unmissable and may, hopefully, resurrect interest in a work which offers such intriguing and fascinating glimpses into the later Wagner.